Performer, composer, and arranger Greg Hopkins first picked up the trumpet as a boy in Detroit, and to this day it would be hard to spot him without his horn. Hopkins plays even when caught in traffic on commute to Berklee College of Music, where he’s been teaching since 1974 - the year the London Times called him “a real find” for the Buddy Rich Orchestra. That symbiosis of man and musical instrument is evident in Hopkins’ solo performances by which he has served the orchestras of Louis Bellson, Billy Maxted, Rich, and Herb Pomeroy, as well as his own small ensembles and big bands. Hopkins began his professional career in 1965, freelancing in the Detroit area for such acts as the Temptations, Marvin Gaye, and Gladys Knight until 1969, when he graduated Michigan State. From 1969 to 1974 he toured nationally and internationally, appearing at the Newport, Monterey, and other major jazz festivals. Hopkins has also performed with Dizzy Gillespie, Ella Fitzgerald, Frank Sinatra, Stevie Wonder, Joe Williams, Tony Bennett, the Supremes, Burt Bacharach, Nancy Wilson, Lou Rawls, Mitzi Gaynor, Michel Legrand, Johnny Mathis, Shirley MacLaine, Marvin Hamlisch, and Lena Home, as well as the Boston Symphony Orchestra, the Boston Pops, and the Boston Brass Ensemble. He recorded as soloist and arranger the "Roar of ‘74" and "Stick It" with the Buddy Rich Orchestra, "Afrodisia" with Lonnie Smith, "Pramlatta’s Hips" with Herb Pomeroy (Shiah). "Together" with Maggie Scott (MM and R), "Orange Then Blue" with George Adams (GM Recordings), "Jumpin’ in the Future" with Gunther Schuller (GM), "Dreams Come True" with Suzanne Dean (NOVA), and numerous others. His theater work includes 42nd Street, Dancin', Some Like It Hot, Annie, Tommy Tune Tonight, Catskills on Broadway, West Side Story, Porgy and Bess, My Fair Lady with Rex Harrison, The King and I with Yul Brynner, Into the Woods, Ragtime, and A Chorus Line. His own 16-Piece Jazz Orchestra CD, "Okavongo", is out on the Summit label, as is his quintet CD, "Quintology", featuring Bill Pierce, Mick Goodrick, and Gary Chaffee. Just released this spring was the trio CD with Tim Ray's chamber jazz group "Tre Corda", featuring Tim on piano, and Eugene Friesen on cello. Hopkins is also featured on the new Grammy® winning jazz cd by composer Joel Pallson and his Septet, on the Icelandic label. Most recently he was trumpet soloist with the Prague Radio Symphony Orchestra on Arthur Welwoods composition for jazz trumpet and orchestra, on Albany Records. "Wind, Sky, and Clouds". Mr. Hopkins busy teaching and performing schedule takes him all over the world doing concerts, festivals, jazz club dates, and clinics. Recently he has visited Italy, Iceland, the Czech Republic, Macedonia, Alaska, Argentina, and many others. A Professor of Jazz Composition at Berklee College of Music, Hopkins has developed and teaches several courses in composition and also directs the Berklee Concert Jazz Orchestra, one of the most prestigious performing ensemble at the school. He has published arrangements and compositions with Kendor, Studio P.R., and Tom Crown Brass Publications. Hopkins continues to write and orchestrate, and is Professor of Jazz Composition at Berklee where the debut of his “Inner Voyage” for Herb Pomeroy’s tribute shook the Performance Center not long ago, with John Abercrombie and Abe Laboriel, Sr. soloing. Hopkins works often with his 16 Piece Jazz Orchestra, and also performs regularly with his quintet, and Tim Ray's trio, Tre Corda. 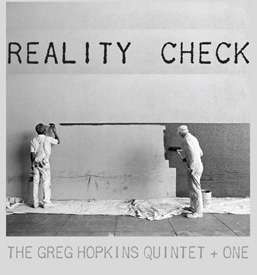 Speaking of his thirty year tenure on the Berklee College of Music Faculty Greg Hopkins tells of the department of which he is called one of "the most revered members"
"To me, the Jazz Composition Department is the nucleus of Berklee. It's graduated some of our most famous alumni: jazz writers like Alan Broadbent, and of course Quincy Jones. Herb Pomeroy started the department, and he really set the direction of the school in the '50s when he started teaching here. So the department has a lot of history." "I love the concept of fusion. We attract students from all over the world, who bring with them their own ideas, their own innate ethnic rhythms, harmonies, melodies, and sometimes instruments. And they combine this with the American ideal of jazz." "I think you have to bring yourself into the music and not just replicate other people's music. That's my whole philosophy. I'll assimilate all I can about Duke Ellington's music, for instance. And I'll try to write some things in his style. Not steal, but borrow. Then I'll let that sit in my system and figure out how I want to use it. I want to create my own language. Some of his sounds, textures, or vocabulary might come out in my music. But my ideas will come out, too. That's kind of what we do in the program." The Berklee Concert Jazz Orchestra is a nationally recognized large jazz ensemble which performs mostly original compositions by the talented Jazz Composition students directed by Greg Hopkins. © 2013 Greg Hopkins. All rights reserved.